Here is the full talk! Day one generally starts with one or two days (or more) induction consisting of PowerPoint presentations and talks from people in the company. If the new employees are really unlucky they may even throw in a few “ice breaker” style games as well. This is a time consuming and often bewildering few days, where the new employee is bombarded with more information than most people can remember. After induction, the new employee starts the general cycle of work. Work hard, gather a little feedback along the way and then at the end of the year run around trying to get feedback for the end of year review. 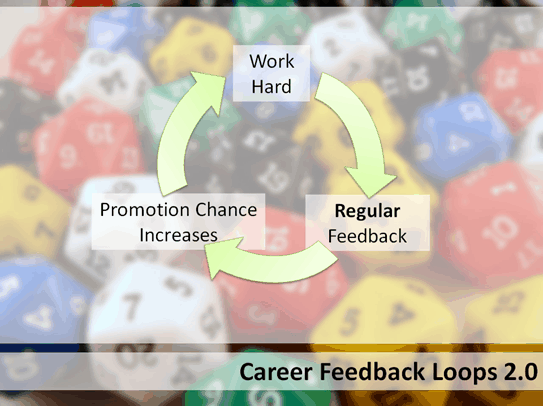 At the end of the year as part of the review process, the promotion dice is rolled to see if they will get credit, or promotion or a pay rise. Then, the cycle starts again. This feedback loop can be soul destroying. Whilst there may be defined grades and expectation frameworks, normally there are no defined short-term achievable goals that are easy to measure against promotion and progress. There are often long term yearly goals, pieces of work that have to be finished in the expected time frames, but nothing more. 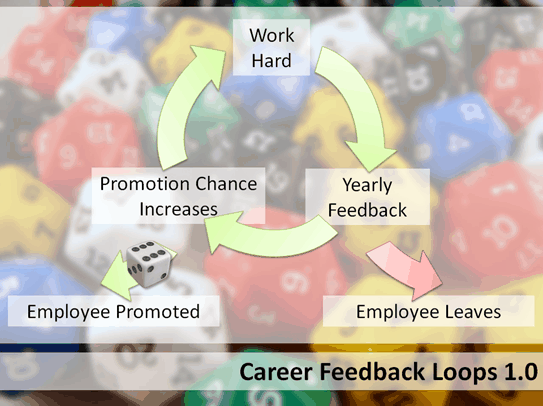 The more times the promotion dice is rolled and nothing comes from it, the more chance there is that an employee will give up and leave. During the course of a career within a company, there is often the opportunity to develop. These days, many large companies want to save costs, so have E-Learning courses made to teach specific skills. These tend to come in one of three flavours. Mandatory, Useful and Patronising but all follow a similar pattern. 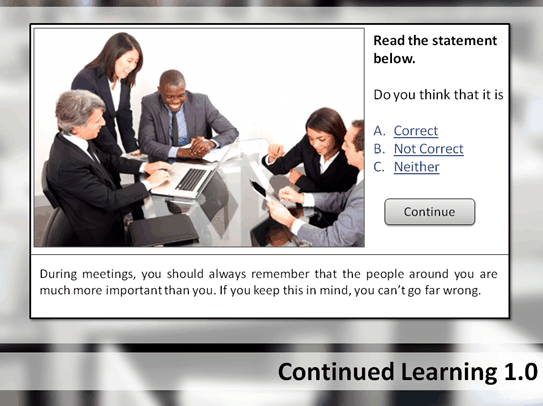 Sit through a narrated slide show, populated by perfect looking stock art office workers and then answer some quiz questions at the end. This is hardly that inspiring and also has the draw back that people can feel that their development is not valued enough to really invest in. First, let’s clear our minds of thoughts of Gamification, Serious Games, Game Mechanics and Gameful Design. Instead let’s concentrate on Game Thinking. 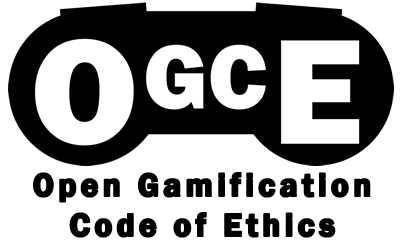 What can we learn from games about engagement, motivation, feedback, learning etc. Rather than a two day “Death by Powerpoint” marathon. Instead Career 2,0 should start with a half day, interactive induction. 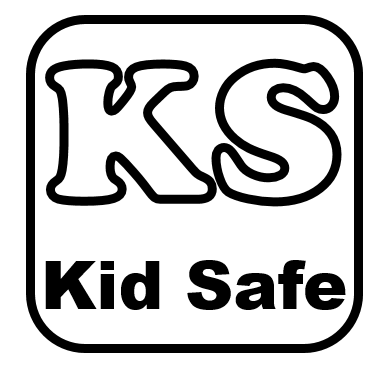 Employees should be given the basics that they need to start their jobs, meet the people they will be working for and with and get some of the more critical information. Next, start the continuous development straight away. Everything that the new employee needs to get going, beyond the day 1 induction, should be available in a Khan Academy style learning system. Social, gamified and interactive. If you want people to learn something , make it engaging! Games don’t have big thick manuals these days (not very often). Instead, they have interactive tutorial levels that teach you how to play, by getting you to play! Also, consider using staggered learning. Set it up so that they have to have done certain things to get their company iPad (if it is not business critical they have it that day) or other non-essential resources. Give defined goals and reasons for doing the courses throughout their career. Remember it is a fine line between fun and engaging and patronising and time wasting. If you are not a game designer – don’t design a game, employ someone who can! 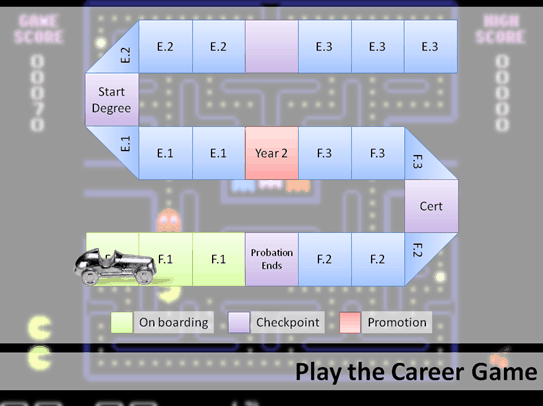 After Induction and after they have completed the mandatory induction learning modules, employees are given their first career game board. Rather than breaking the career up into a few widely spaced grades (F E D C B A), set it up as shorter, more attainable sub grades. F1, F2, F3 – think of them as levels and mini games in a game. 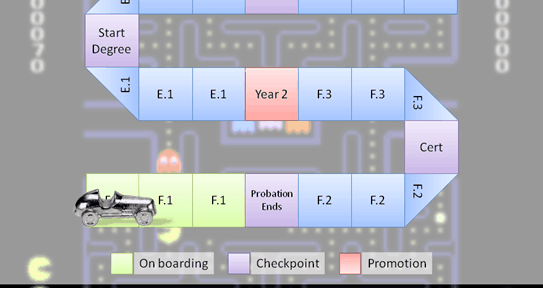 All the key goals should be mapped, the end of probation, certificates the employee wants to get, degrees etc. We are much better at managing short goals than long goals. These game boards should cover no more than a year or two – things change! It should be possible for an employee to see where they are on the board at any time in their career. Think about a game like Super Mario. It is broken down into levels. Each level is manageable with some work. You can always go back to the map to see where you are going next and where you have been. As the employee continues their journey in the company, consider the flow of their career. Mihaly Csikszentmihalyi gives us this great concept of FLOW, the optimal point between frustration and boredom. If the challenge of a role doesn’t increase with the skill level of the employee, it becomes boring. If it rises faster than the skill level of the employee, they get frustrated. Either way, being bored or frustrated for any length of time is a sure way to lose an employee! People these days are used to feedback everywhere. It is not them looking for constant validation, it is just how they are. Games give constant feedback, phones buzz all the time, emails pop in instantly. Everything happens straight away, Consider a video game where you only find out how you did, a year after you complete it? 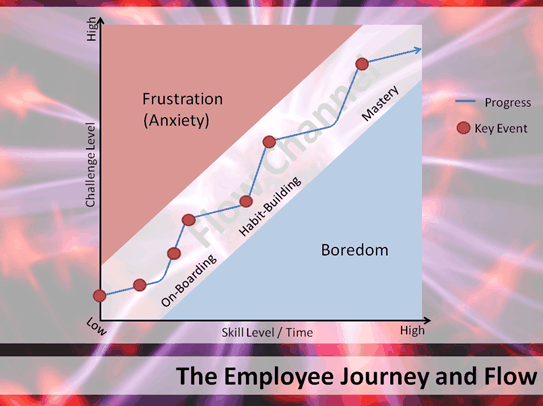 Regular feedback with constant training, development and challenge need to be balanced to keep the employee in this state of flow. Combine this with the career game board and an employee should always know how far from promotion or at least the next big step in their career. 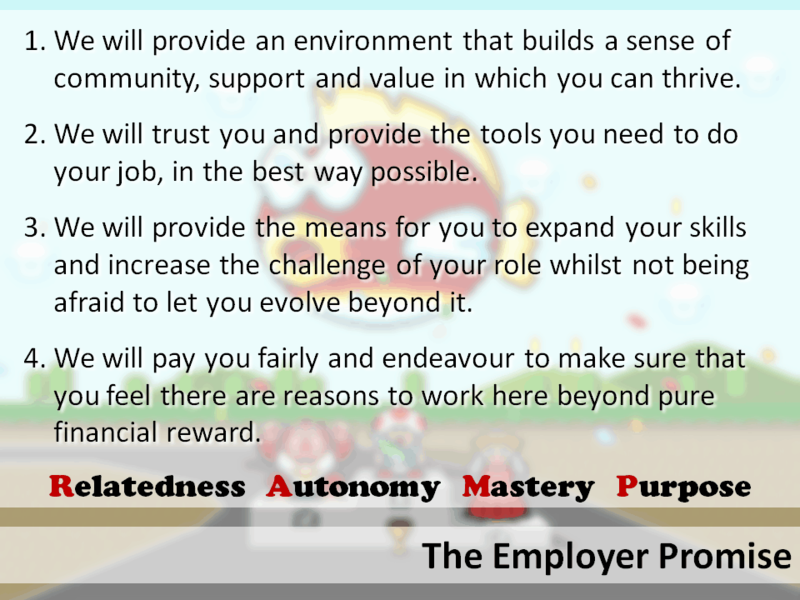 One last slide, this is a series of promises that I feel every employer should be able to make to an employee based on the RAMP framework. Valve hand book should be every companies bible in my opinion! Companies forget that the people make it work, not the technology or the upper management. I spend too many time on reading your posts.My first goal is reading all of your posts.